Mykal Kilgore is currently preparing to make his Centerstage debut as Stevie Wonder in the world premiere musical Marley, which begins performances May 7th in Baltimore. On Broadway, Mykal was part of MOTOWN The Musical playing the roles of Dennis Edwards, Miracle, Jr. Walker and Commodore while also understudying the role of Marvin Gaye. Also on Broadway, he was a member of the tribe in Hair. Off-Broadway he performed in the family musical Freckleface Strawberry. 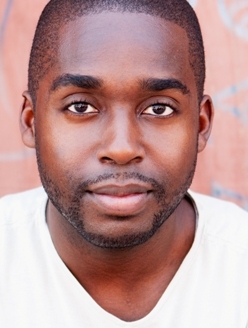 You might have also seen Mykal in The Book of Mormon as part of the 1st national touring company that played at the Kennedy Center, or in the 2014 comedy short Specials. He has performed in such prestigious NY music venues at Joe’s Pub, Roseland and Birdland. As you can see, Mykal is no stranger to the genre of pop-rock musicals nor is he a stranger to portraying musical icons. Here is a young performer with some very impressive credits, and I don’t see him stopping anytime soon. It has been said that the theatre brings people together in hard times. This last week has been a trying and tense one for the city of Baltimore. 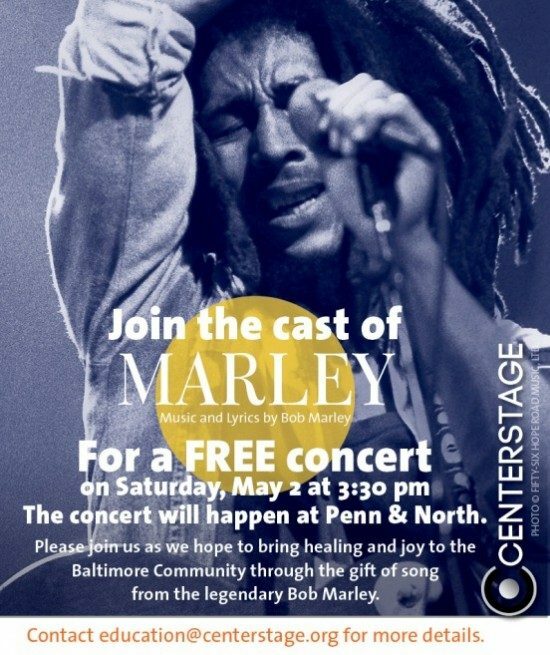 It seems to me that Marley at Centerstage can help the city’s healing process as Bob Marley was a very peaceful and spiritual soul. If you enjoy seeing new musicals featuring some really good talent like Mykal Kilgore, consider helping Baltimore come back from the violence and caos by attending a performance of Marley (or any other show for that matter) in that city. It’s a win win situation for all. The city tries to return to “normal” and you get entertained by Mykal Kilgore and company while helping heal Baltimore. Good stuff!!! What was your first professional performing job? The first time I ever got paid to sing was when I was in college. I was asked by a classmate of mine to be a section leader in his church choir. Basically, I was there to make sure that there was somebody that wasn’t totally off-key! I went to rehearsal, sang in church, and he handed me a check! I was caught so unawares, because I spent my whole life singing in churches for free… I’ve been spoiled ever since! I did my first secular job at Hershey Park in Hershey Pennsylvania. I played a Singing Milkman in an outdoor show. We used to do 5 shows a day!!! I don’t know if I’ll ever have to work as hard as I did that summer again. How does your character of Stevie Wonder play a part in the story of Marley? Bob and Stevie have a beautiful moment in the show that encapsulates their real life friendship. They had a mentor/mentee relationship where Bob learned from Stevie’s example of philanthropy and commitment to his community. It’s interesting to listen to the music they were creating at that time. They both really influenced one another. 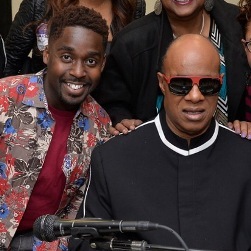 Mykal Kilgore with the real Stevie Wonder during a recent performance in Baltimore. Photo courtesy of Centerstage. You performed in a show for kids called Freckleface Strawberry and then also in The Book of Mormon on tour. These two shows are at both ends of the spectrum as far as the ages of the audience that attends them. Do you find it different performing for kids over adults? Children are the best kind of audience, because they don’t lie. If you are truly funny they will laugh. If you are truly boring they will sleep. They are a perfect litmus test for is something “works” on stage or not! Adults, most adults, have such good manners that they will find a way to be at least “respectful” of your performance if it isn’t great. And on the other hand adults don’t really unleash themselves like kids do when they are really enjoying themselves. Bob Marley had such a prolific career in music. Why do you think it’s important to remember him? He was an artist with a point of view. He wrote things that were important to him and to his world. Love, Violence, Struggle, God thoughts, Loss, Strength and so many other pieces of the human condition made up his lexicon of music. These things are timeless. Bob is as well. What is next for you after Marley? After Marley I am hoping to do some recording in between cocktails and trips to the beach and then I’m going to tour Australia and Asia as the MC for Scott Bradlee and Post Modern Jukebox.